Note: This document covers functionality added in BrainTree for Caldera Forms 1.2.0. BrainTree for Caldera Forms allows you to accept one time credit card payments or subscription plans on your WordPress site using BrainTree. If you have not already read the BrainTree for Caldera Forms Getting Started guide, please do so before continuing with this document. That document shows how to find your BrainTree merchant ID, Merchant Account ID, API Public Key and API Private Key, which are required for setting up this payment processor. 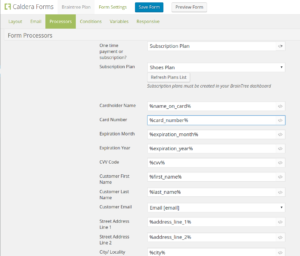 The BrainTree for Caldera Forms add-on does not have the power to create payment plans for subscriptions and repeat billing. Before setting up your Caldera Form for creating recurring payments through BrainTree, you must add one or more plan in your BrainTree account. 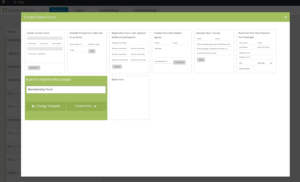 In the “New Form” modal, select the BrainTree Payment Plan Example template. 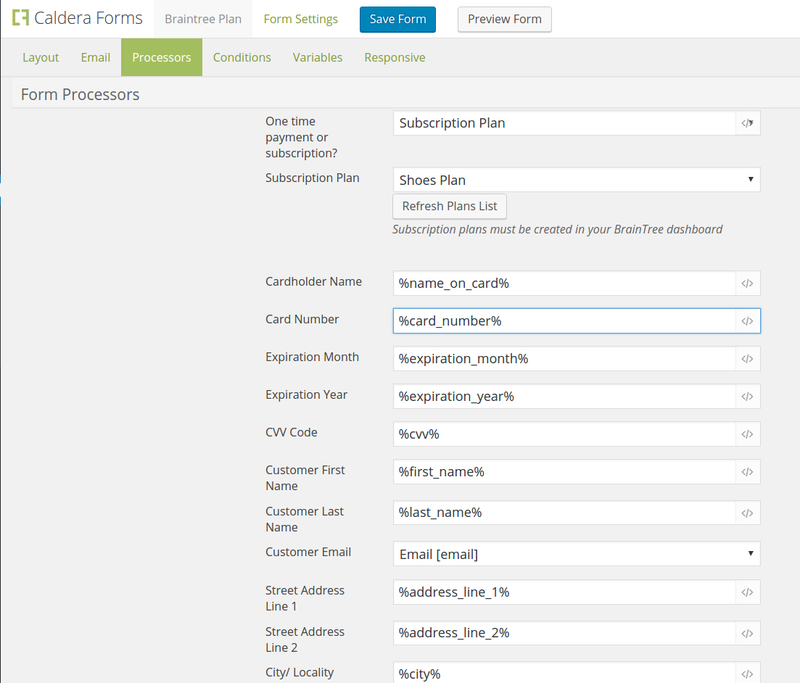 In the form editor for your form, click the Processors” tab and then select the BrainTree for Caldera Forms processor. Follow the instructions in the getting started guide for adding your BrainTree merchant ID, Merchant Account ID, API Public Key and API Private Key to the processor. You should use your Sandbox API credentials to test. You should now see an option called Subscription Plan . Click the Refresh Plans button. This will cause a spinner to appear momentarily in the button. 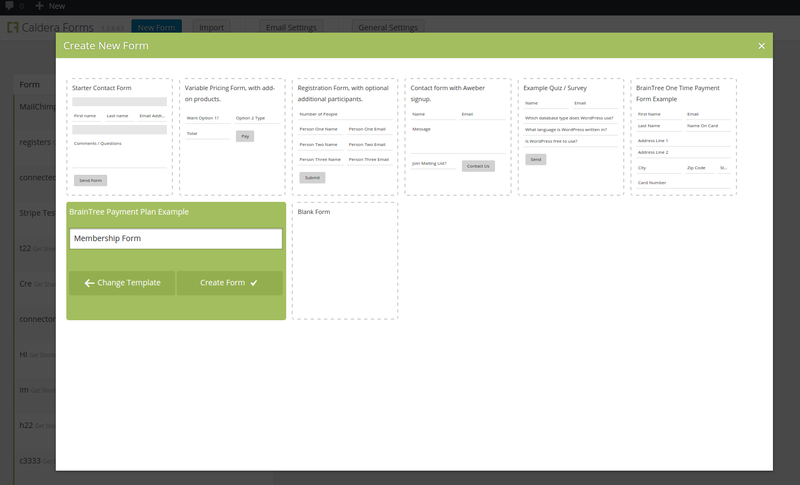 When it is done, you should see all of the plans you created in BrainTree in the “Subscription Plan” dropdown. Select the plan you wish to use from the Subscription Plans option. BrainTree recommends capturing payment details, but not submitting for settlement immediately. You can override this behavior and charge cards right away by checking the “Submit For Settlement Immediately?” option. The “Cardholder Name” field must contain the full name on card. You can use, one field, or join two fields (first and last name) using a variable. The card number, expiration, year and CVV code fields are required. For security reasons, the credit card number and CVV code will not be stored in the entry details for the entry. When you are done, click the Save Form button. You may use the Preview Form button to test your form. When you are satisfied with your form, disable the test mode option, update your API credentials for production and add the form to any WordPress page or post using the Caldera Forms Shortcode.